I took one interior design class in high school. I enjoyed the class, but I don’t even remember how I ended up in it. Needless to say, I am not qualified to tell you how to design your home. I simply think very few homes benefit from bare walls and only necessary furniture. Even minimalism shows intent, prison cells do not. In an effort to liven up his room a little, I drew a dinosaur on a sheet of paper. And in a great show of friendship, he left it hanging for the rest of the school year. I am certainly no artist. I’m not saying I blame him for not trying to turn his walls into a museum of his life; college dorm living is all about the temporary and living off of things that will all fit in your car in the spring. His room caused me to really see the benefit of putting a little of yourself into your decoration. The way I see it we are as much a reflection of the space around us as the space around us is a reflection of who we are. Yeah? Maybe you like pastels. Awesome. Maybe you like black and white contrasts. Fantastic. Maybe you can’t get enough prints. More power to you. Your individual tastes will find a way into your space one way or another, through fabric choices, pictures on the walls, whatever you want, and that’s the best part of designing any space. Then, your space will get to design you a little. What? I just mean that if bright red lipstick can make you feel bold, why can’t your walls? Blues can be relaxing, yellows energizing. But it also goes beyond that. The sculpture sitting on your bookcase that can make you smile every time you see it, the piece of artwork on your wall that you created yourself, these things form the real sense of a “homey” environment, not the wall treatment. You’re a part of everything you create, and everything you create is a part of you, even if it’s just a simple project to give your space some life. 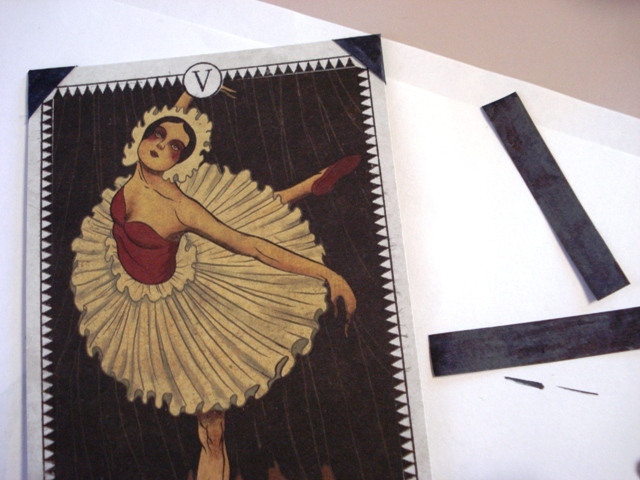 Book matting idea from this book. 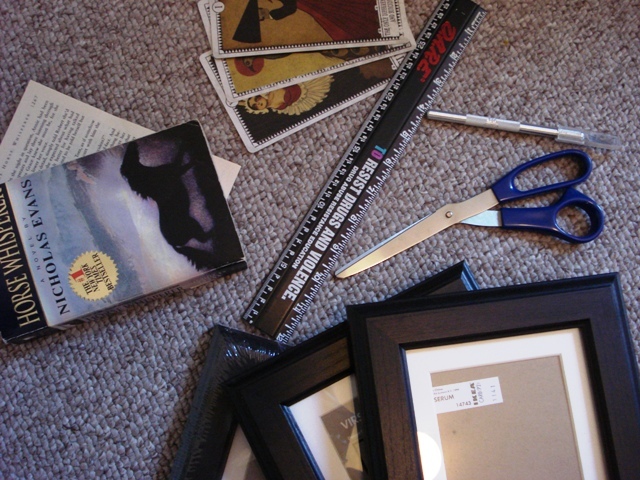 You will need a frame, an image you’d like framed (I used cards that came with the special edition CD of a band that I love), an old book you will never read again, scissors or an exacto knife, and a ruler. Not pictured: all-purpose glue, white paper and a black marker or black paper, and clear tape (optional). All you’re doing is cutting out random shapes from the pages of the book. I like to trim off the margins so there’s less blank space in the final product. 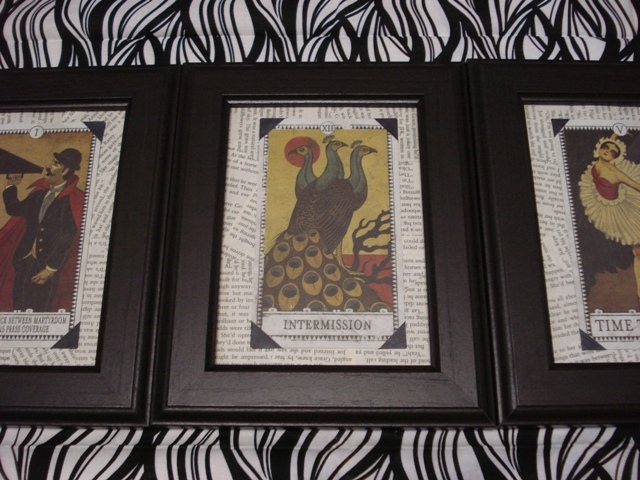 Then you just start gluing to the cardboard backing of the frame. 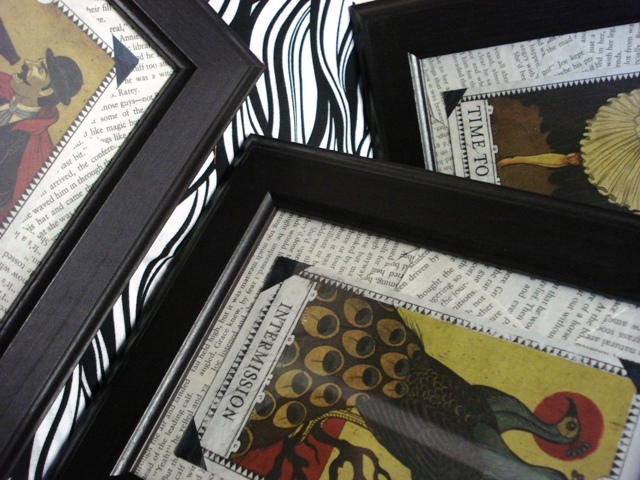 Or a piece of paper the size of your frame. Whichever you prefer. And it’s alright if you don’t cover all the way to the center because your chosen image will cover it. 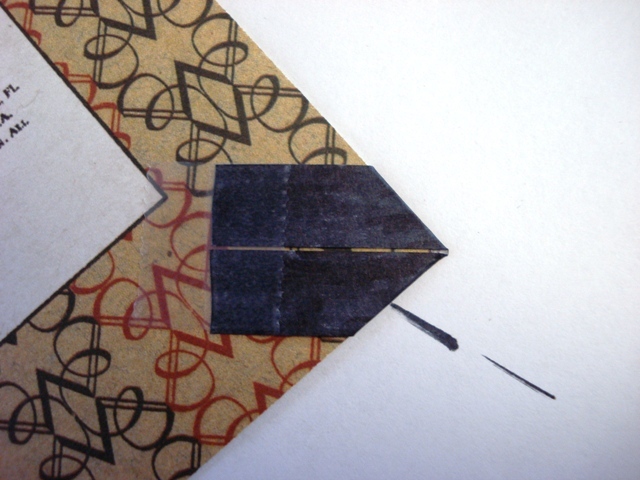 For the corners, I just cut a strip of white paper about ½” wide and color it with a black marker. 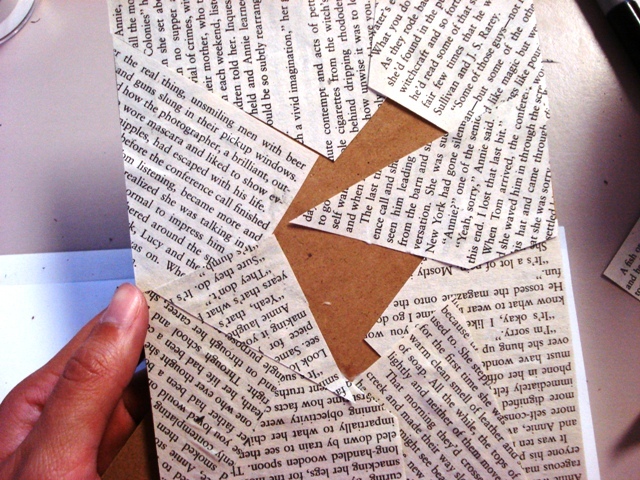 Cut it into four pieces and then just wrap them around the corners. The back of the image will look like this in the corners. 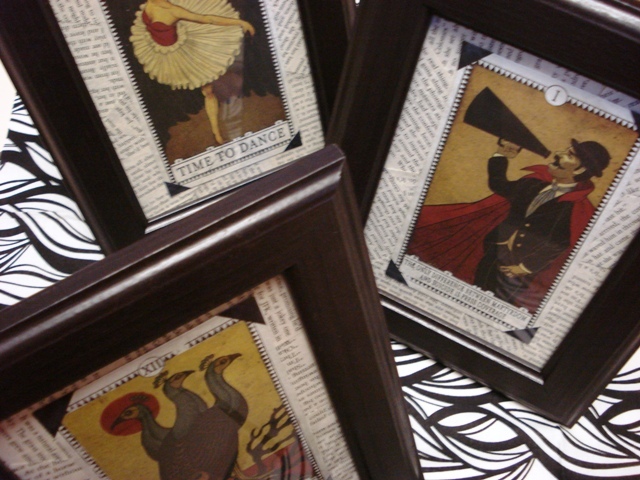 Glue or tape the image to the back of the frame and you’re done! Find a nice spot for it on your mantel or on a book shelf, then step back and admire. 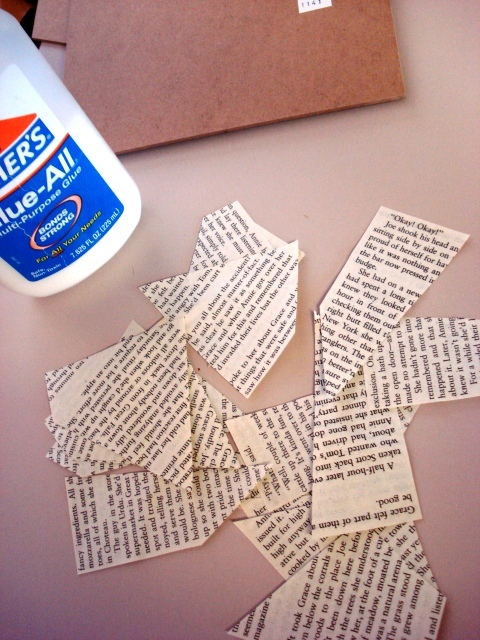 * This same concept would also work really well with other types of paper such as sheet music or scrapbook paper.